To access the Alexa Voice Service (AVS), your Alexa-enabled product needs to obtain a Login with Amazon (LWA) access token, which is sent with each request to AVS. If your product lacks a graphical user interface (GUI), also known as headless, you do this by integrating a companion app with the LWA Mobile SDK for Android or iOS. Your companion app is responsible for obtaining an authorization code and securely transferring it to your product. Your product is responsible for using the authorization code to obtain access and refresh tokens from LWA, which are used to make calls to AVS. This document explains how to do this. Alternatively, if you want to authorize a headless product to use AVS with a web service, see Authorizing from a Companion Site. Scenario: You want to authorize a headless device, like a smart speaker, to access AVS and associate it with a customer's account using a companion app. A code verifier is a cryptographically random string generated by your product, which is hashed (SHA256) and handed off to your companion app. The string should be between 43 and 128 characters long and composed of characters from the URL and filename-safe alphabet ([A-Z], [a-z], [0-9], "-", "_ ", ". ", "~"). The code verifier is sensitive data and should never be transferred from your product. A Base64url encoding of your code verifier's SHA256 hash. The Base64url encoded string should not contain the following characters: "=", "+", or "/". See Proof Key for Code Exchange by OAuth Public Clients, Appendix A for detailed information on implementing Base64url encoding. The method used to derive the code challenge. AVS requires SHA-256. Your product sends these values to your companion app, and your app displays a Login with Amazon Button to the user. When the LWA Button is pressed, the user, along with the values requested in step 1, is redirected to an Amazon login page and prompted to enter their Amazon credentials and consent. After consenting, the user is redirected back to your companion app along with an LWA authorization code, which is valid for 5 minutes and a single use. Your product calls LWA, and the Authorization Code, Client ID, Redirect URI and Code Verifier are exchanged for a refresh token and access token. LWA returns a refresh token and access token to your product. Your product uses the access token to make calls to AVS. When your access token expires, exchange the Client ID from step 5 and your refresh token to request a new refresh and access token from LWA. Only establish a new connection with AVS after your client has successfully received and updated the tokens. If the token exchange fails, your client is expected to retry with an exponential back-off. Repeat this step every time your access token expires. LWA returns a new refresh token and access token to your product. Important: The instructions below assume that you are using the latest version of the LWA SDK. Follow the instructions below to use LWA SDK for Android to pass a LWA authorization code to your product, which your product can then use to obtain refresh and access tokens needed to make calls to AVS. Register a device in the Amazon Developer Console and generate an API key for your product. For instructions on how to create an account and register a product see Getting Started with AVS. Navigate to Login with Amazon Getting Started for Android and complete steps 1, 4, and 5. AuthorizeListenerImpl extends the AuthorizeListener abstract class and will process the result of the authorize call. It contains three methods: onSuccess, onError, and onCancel. The AuthorizeResult object passed into the onSuccess method will contain the values needed to obtain an authorization token. Create an instance of AuthorizeListenerImpl and register it. Create an instance of your AuthorizeListenerImpl and register it with your RequestContext instance. When the AuthorizeManager.authorize call is made, your RequestContext instance will invoke the appropriate callback method in your AuthorizeListener with the result of the authorize request. The best place to register your AuthorizeListenerImpl instance is in the onCreate method. Override the onResume method in your Activity. Call super.onResume() as well as the onResume method on your RequestContext instance. This will notify the RequestContext to invoke your AuthorizeListener when your app is resumed if there is a callback ready from your AuthorizeManager.authorize call. Switches to the system browser and lets the customer sign in and consent to the requested information. Switches to web view in a secure context to let the customer sign in and consent to the requested information. This secure context for the second point above, is currently made available as the Amazon Shopping app on Android devices. Amazon devices running Fire OS (for example Kindle tablets and Fire TV devices) always use this option even if there is no Amazon Shopping app on the device. Because of this, if the customer is already signed in to the Amazon Shopping app, this API will skip the sign-in page, leading to a Single Sign On experience for the customer. When your application is authorized, it is authorized for one or more data sets known as scopes. Scopes are an OAuth mechanism for a client to tell an authorization server what resource permissions they need. You pass an array of scopes as a parameter to the authorize method. The first time a user logs in to your app, they will receive a prompt that contains the list of data you require access to, and request consent before proceeding. LWA when used with AVS requires the alexa:all scope. The alexa:voice_service:pre_auth scope enables the AVS Hosted Splash for the user. Important: To use AVS hosted splash, you must include the alexa:voice_service:pre_auth scope, and remove your existing splash screen. All new products are required to utilize the AVS hosted splash scope. The call to authorize is asynchronous, and your AuthorizeListenerImpl instance will be invoked with the result of your call. scopeData is extra data that includes the product type ID (PRODUCT_ID) and the product’s unique DSN (PRODUCT_DSN), that is bound to the alexa:all scope. A constant which specifies that the authorization code should be returned. The code challenge. For Base64 URL encoding we recommend using Android’s Base64 library with the following flags: Base64.NO_PADDING, Base64.URL_SAFE, and Base64.NO_WRAP. The code challenge’s encoding method (S256). The authorization code you’ve obtained is valid for 5 minutes and a single use. Implement onSuccess for your AuthorizeListenerImpl. Retrieve the authorization code, redirect URI, and client id from the AuthorizeResult to be sent securely to your product. code: The authorization code received from the Android app. redirect_uri: The redirect URI received from the Android app. client_id: The client ID received from the Android app. code_verifier: The code verifier that was initially generated by the product. expires_in: The number of seconds for which the access token is still valid. Follow the instructions below to use Login with Amazon SDK for iOS to pass a Login with Amazon authorization code to your product, which your product can then use to obtain refresh and access tokens needed to make calls to AVS. Navigate to Login with Amazon Getting Started for iOS and complete steps 1, 4, and 5. Import the Login with Amazon API to your source file. If you followed the steps to Add a Login with Amazon Button to Your App, you should have an onLoginButtonClicked: method linked to a Login with Amazon button. In that method, call authorize:withHandler: to prompt the user to login and authorize your application. The secure context for the first option is available when the Amazon Shopping app is installed to the device. If the user is already signed in to the Amazon Shopping app, this API will skip the sign in page, leading to a Single Sign-On (SSO) experience. The first parameter to authorize:withHandler: is an AMZNAuthorizeRequest object that indicates what scope your application is requesting authorization for. 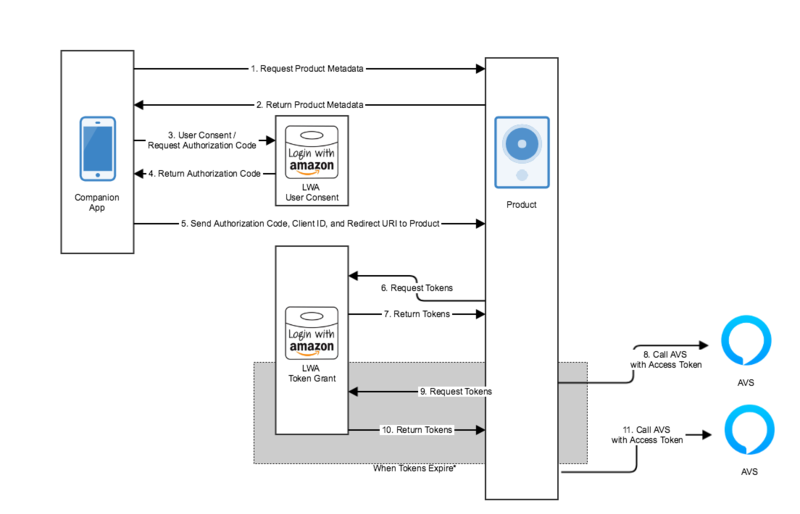 A scope encompasses the user data you are requesting from Login with Amazon. The first time a user logs in to your app, they will be presented with a list of the data you are requesting and asked for approval. The second parameter to authorize:withHandler: is AMZNAuthorizationRequestHandler, described in the next step (for code sample, see step 3). Create an AMZNAuthorizationRequestHandler block object. AMZNAuthorizationRequestHandler processes the result of the authorize:withHandler: call. To learn more about objective-c blocks, see Working with Blocks on developer.apple.com. The first parameter of AMZNAuthorizationRequestHandler is an AMZNAuthorizeResult object. After a user is authorized successfully, AMZNAuthorizeResult will contain an access token which can be used to access a user’s profile data, and an AMZNUser object, which contains the user’s profile data. The third parameter of AMZNAuthorizationRequestHandler is an NSError object which contains error details if the login and authorization fails due to the SDK or authorization server. Securely transfer the authorization code, client ID, and redirect URI to your product. code: The authorization code received from the iOS app. redirect_uri: The redirect URI received from the iOS app. client_id: The client ID received from the iOS app.